I was Protestant Chaplain at Maine State Prison for 18 years, 1987-2006. Sometimes I wish I had never left. 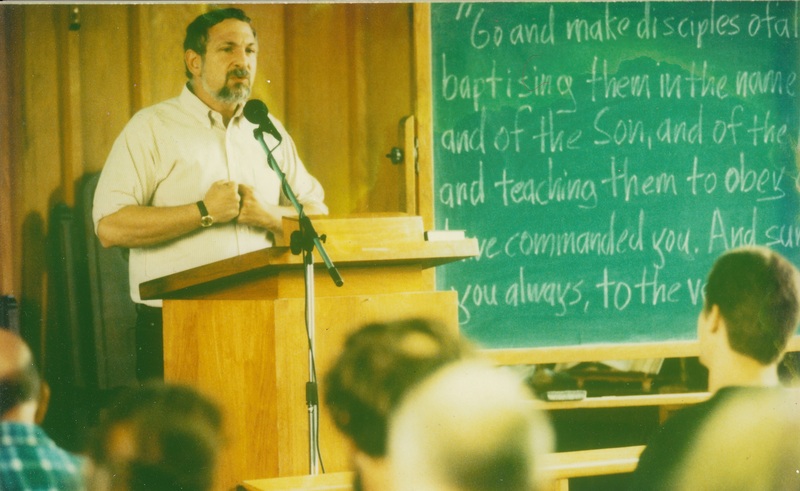 I miss the fellowship I had with so many faithful volunteers in Yokefellows, Herb Mullen, Cedric Delano,Jim Yesberger, Howie Charbonneau, Brian Vandenbrink, Kilton and Troy Crabtree, Sam Pendleton, and Peter Hart, just to name a few. And I miss all our friends from Chestnut St. Baptist Church. But at the time I believed God was calling me to New Hampshire.And Chris and I have had some good ministry and good fellowship here in New Hampshire as well, at South Main St. Church, Goffstown Congregational, and His Mansion. Now Chris is on staff at Crotched Mountain Rehab, taking care of severely disabled young women. And I have a ministry I’m really enjoying in the County Jails of New Hampshire. I was raised in an upper-middle class home, in an affluent Connecticut suburb. My parents were Jewish, but this meant more to them as an ethnic identity than a religion. The strongest values in my home growing up were not religious, but achievement oriented. Looking back, I can see that I went off to college totally empty spiritually. It was the height of the sixties, and I was terribly vulnerable to the myth of the age. Before long, I was quite addicted to drugs. The years from 1968-1973 were my worst. I had gotten into a good college, but I had to drop out in my junior year. I was too spaced out, too addicted, too depressed, to go on. A dismal series of petty arrests, hospitalizations, rehab programs, and drug binges followed. I smashed up several of my father’s cars in this period. I was totally lost. Often, in these years, as I wandered city streets, I would talk to people who stood on street corners passing out Christian tracts. I admired their courage, and in my loneliness, I appreciated their willingness to talk to me. And so I began to hear the Gospel. Finally, the Lord led me to a Christian program called “His Mansion.” It was there I gave my life to Jesus. It was April 11, 1973. As I went for the first time to the Cross of Jesus Christ in prayer, and left my burden of sin and shame there, I felt a powerful peace come over me. A weight of guilt I hadn’t even known I was carrying came off me there that day. I knew that Jesus had taken away my sin. I found him as my Savior. I have been involved in prison ministry since 1982. From 1987 to 2006 I served as Protestant Chaplain in Maine State Prison Since then I have served as Pastor to a local church, as well as staff member at His Mansion. But my first love is still prison ministry. I’m starting this blog in the hopes of fostering discussions with my readers about prison ministry, and about healing from addiction and other besetting sins. But I’d love it if this blog became a more general discussion of what God is doing in our lives, and how he is working through the church. What does it mean to be a follower of Jesus? Are there ways we could follow him better? Please join the discussion!